Today’s home theaters can be almost as good as a movie theater. There’s a lot to consider when planning your perfect room, everything from audio and visual components, to seating and décor. But when finalizing your plans, don’t overlook the importance of flooring. Flooring can control the mood and the sound, and be the difference between a good and a great theater experience. 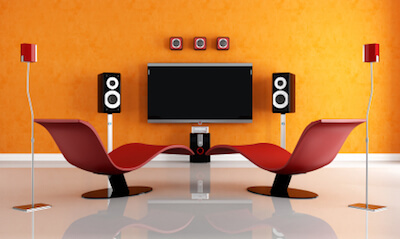 Your flooring choice impacts home theater acoustics. Deadening the room’s reverberation is crucial. Reverberation is the sound that remains in the room after the sound stops. If you’ve ever clapped your hands in a big, open room and heard the noise bounce around you – that’s reverberation. In a home theater, the chance for reverberation peaks with every movie you play. Imagine a quiet scene where the actors voices blend together. Or an action scene where loud noises play out at a deafening level. Not a great experience. Since sound waves bounce off hard surfaces, flooring is the starting point to increasing your satisfaction level in your home theater experience. When sound waves are allowed to bounce off hard surfaces, you lose audio clarity. The sound from your speakers will be muddy and noisy. Using wood or laminate will produce sound decay and have a booming quality in the sounds as they enter your room. Think of when you played in the band in a school gymnasium. Wood and laminate are probably not your first choice for a great home theater experience. If you use wood or laminate, pay special attention to the details. Fill in the space with high quality area rugs. Plush fibers will help eliminate the worst of the reverb. Carpeted floors are generally considered to be the best option. Carpeting absorbs and prevents excess reverberation around the room. Wall to wall carpet will provide the best soundproofing, helping to clarify the sound from your speakers as it surrounds you as you listen. Many home theaters are built in unfinished basements. With the possibilities of building from the ground up, you can create an idea experience in any way you choose. While electronics and décor can create the mood, remember flooring is what creates the quality sound. Let us help you choose the right flooring to create your home movie experience.